QUOTE | "[You] can't sell sand at the beach." 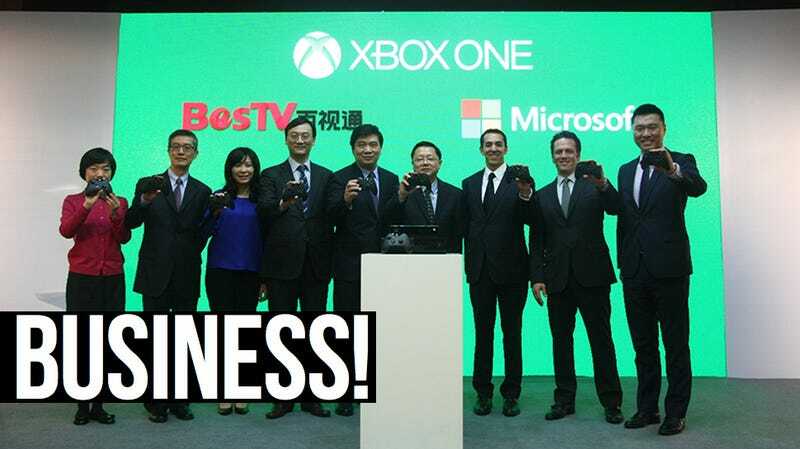 - American McGee, head of Spicy Horse, talking about Microsoft's plan to sell Xbox Ones in China, which he believes will fail for multiple reasons. QUOTE | "VR is an incredible experience, the technology is here, and I think VR is here to stay this time." - Virtuix CEO Jan Goetgeluk, talking about the market for VR products and why he'd rather be early than late. QUOTE | "I don't see a future for the subscription model." - Trick Dempsey, producer for the MMO Defiance, explaining why Defiance is becoming a fully free-to-play game in June. QUOTE| “Because we call them 'games,' many people do not realize the vital role video games play in how our children learn in school and what young adults study in college" – ESA CEO Michael Gallagher talking about the growing importance of video game education across America. QUOTE | "We have our moment, and that's something you really don't always get at the holiday with your brands." - Ubisoft SVP of sales and marketing Tony Key, talking about the pluses and minuses of delaying Watch Dogs from last holiday to this May. STAT | 2.5% – Amount that Rovio's revenues grew in 2013 over 2012, to €156 million, mostly from Angry Birds; the company's profit dropped to €26.9 million, less than half of the previous year's profit. QUOTE | "The TL;DR is really: if you're an indie developer, don't make multiplayer games." - Dan Marshall, developer of Gun Monkeys, advising indie developers to avoid creating multiplayer games for many reasons. QUOTE | "If you want to sell 10 million or more copies of a console game, TV is not going away yet." - Activision VP of global brand marketing Jonathan Anastas, talking about how social media can't do everything when it comes to marketing games. QUOTE | "Each game that we produce will be a separate, standalone, special purpose company." - Nick Baynes, founder of Ironfist Games, talking about the new business model he's bringing to game development. QUOTE | "Free-to-play has been, and continues to be, so exciting because it's growing so rapidly." - Ben Cousins, veteran of DeNA and EA and now a consultant, talking about why he thinks F2P is overtaking the game industry. QUOTE | "Honestly, students are too well prepared for crunch. Crunch happens due to poor planning, and most students do not excel at planning." - Jesse Schell, CEO of Schell Games and professor at Carnegie Mellon University's ETC, along with an ETC alum and student, talking about what students should get from a game education.